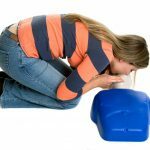 Intended Audience: Teachers, Daycare Providers, Coaches, Office Workers, new parents, or anyone who wants or needs to learn the life-saving skills of CPR and are not a healthcare professional (healthcare professionals are required to take the more advanced BLS Healthcare Provider CPR course). This course can also be taken in an convenient blended learning format where some coursework is done online before class to receive the same certification card. Click here for online / blended learning information or sign up for a classroom course below. Description: This class combines CPR, AED and First Aid Training in to one convenient session. 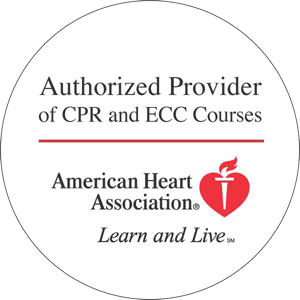 Heartsaver CPR/AED with First Aid (as the American Heart Association classifies this course) teaches the skills necessary to recognize and provide immediate care for breathing problems, cardiac emergencies, injuries and sudden illnesses until medical personnel arrive. Participants will be certified by the American Heart Association for: Standard First Aid and CPR/AED for adults, children and infants. This course meets the Rule 2 and 3 requirements for childcare providers.